Portsmouth captain Gareth Evans hopes to play more of a pivotal role at Wembley than the last time he was picked in a side there. 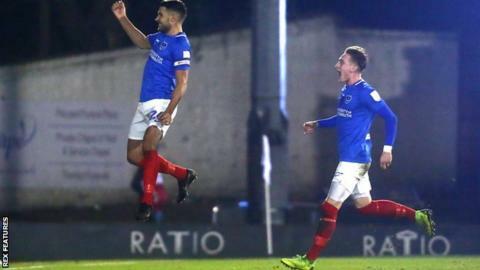 The 30-year-old's free-kick helped Pompey reach the Checkatrade Trophy final next month as they beat Bury 3-0. Evans was an unused substitute for Fleetwood when they beat Burton in the 2014 League Two play-off at Wembley. "I think about that most days to be honest," he told BBC Radio Solent. "It will be great to get out there." Evans put Portsmouth ahead just after the hour at Gigg Lane before goals from Oliver Hawkins and Ronan Curtis ensured the club's first trip to Wembley since the 2010 FA Cup final. "Hopefully I stay fit and the manager picks me," Evans added. "Playing at Wembley is something as a young lad you always want to do, in any competition." Portsmouth won for the first time in nine games in all competitions having drawn their past five League One fixtures. Manager Kenny Jackett hopes the Wembley fever can put them back on course for an automatic promotion push. "This win has been coming for a while after those draws," he said. "Hopefully we can take the confidence from this performance into Saturday against Bradford. "There will be some genuine excitement around the club as Portsmouth haven't been to Wembley for a few years."